Titan Comics’ Doctor Who range has been on a roll lately. We’ve had the spectacular crossover series The Four Doctors, and Paul McGann’s Eighth Doctor just kicked off a promising solo series. But now he’s being joined by another Classic Doctor in the line: none other than Tom Baker’s Fourth Doctor himself. The series, announced by Comic Book Resources this morning, will feature Tom Baker’s iconic incarnation of the Time Lord and perhaps his most famous companion: Sarah Jane Smith, who was played by the dearly-missed Elisabeth Sladen on TV. Sadly, the duo are only returning for a limited time: rather than an ongoing series, the comic will be a 5-part miniseries. “Gaze of the Medusa,” written by Gordon Rennie and Emma Beeby with art by Brian Williamson, will see The Doctor and Sarah Jane head to Victorian London, where a mysterious woman controls an army of cyclops creatures with an alien power as old as Earth itself. Considering the roll they’ve been on with Doctor Who lately, the thought of a story for one of the most iconic Doctor/Companion pairings in the show’s history is almost too exciting to bear. Let’s hope Titan ends up doing a full series of new adventures for the Fourth Doctor at some point! 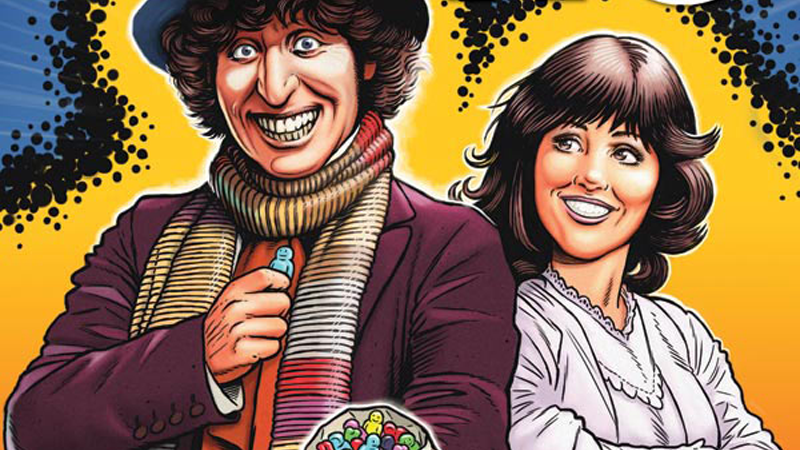 The Fourth Doctor #1 will be out in March 2016. Header Image Credit: The Fourth Doctor #1 variant cover, by Jay Gunn.